Did you know, In the U.S. and European public opinion polls Blue is overwhelmingly the most popular colour, chosen by almost half of both men and women as their favourite colour. From runway to our wardrobe autumnal tones and pastels are adding up to being the biggest rollers this year, but blue (dark, light and everything in between) also had a strong presence on the catwalks. From cerulean, cyan and cobalt to navy, sapphire and periwinkle, countless shades of blue are going to be seen on dresses, tops, skirts and more this season. There was a huge presence at Burberry and Richard Nicoll’s. It’s a color that can last the seasons and can be interchangeable. This means in summer, spring, winter there will always be a calling for blue shades. When you’re updating your fall wardrobe in the coming months, don’t forget to add some color to your usual dark colors! 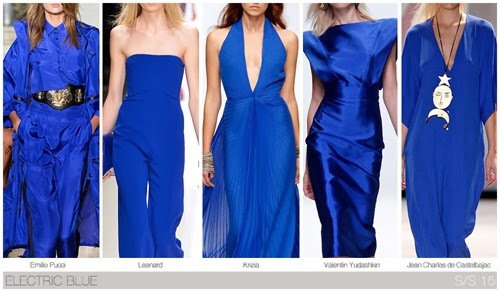 Take a hint from the aforementioned designers and make blue a staple in your closet. What I like about blue is its versatility. You can wear as much or as little as you like. People who look best in large amounts of blue usually look good in jewel tones and have bolder coloring. If you have other coloring, it’s probably best to keep blue reserved for an accent piece like statement necklace, bold rings, to-die-for heels. Must see mixes with a plethora of colors like yellow, coral, teal, mint, pink, white. But don’t just focus on pairing with outside shades, why not stay within the cool blue but mix the textures like this sheer shirt and disc maxi skirt. It oozes sophistication and class. For a powerful work look, a royal blue dress can get the job done helping you stand out. There is a lot of power in royal blue so make sure your own coloring can stand up to the bold shade or else it may steal the show. If your not feeling brave enough to pull off this block of color pair up fitted pencil skirt, electric blue spaghetti top with matching blazer. Ultimate corporate look – to make your outfit pop add statement necklace with orange shades. For casual, weekend looks lean towards the pastel shades of blue bringing you into the spring months. Don’t just focus on in operating blue shades into your outfit, remember to use your accessories to charm the blue tones or if you are looking to add the color if the season use them to shine through. Marc Jacobs have a gorgeous range of watches available gold straps with blue faces, Michael Kors always have a beautiful range of bags and clutches in Navy. You’ve heard the fashion myth: Under no conditions should black and navy blue ever be paired. We’ve got news for you: That once-unbreakable rule has been shattered well and truly…! The combo first started making waves during the Fall 2012 collections, as scores of designers including Carolina Herrera, Miu Miu, Gucci, Prabal Gurung and Céline sent looks that incorporated black and navy down the runway, while style influencers like Alexa Chung, Mary-Kate and Ashley Olsen, and Kate Bosworth were quick to jump on the trend, proving just how cool the pairing can be. Now seeing glimpses of blue back in the collections such as Fendi spring/summer 2015. Styling Advice: The best way for putting together a black and blue look is to make sure the colors are distinguishable from each other, and keep the fabrications in similar families, i.e. silks with other light weight fabrics, wovens with wovens, jersey with jersey, and so on! 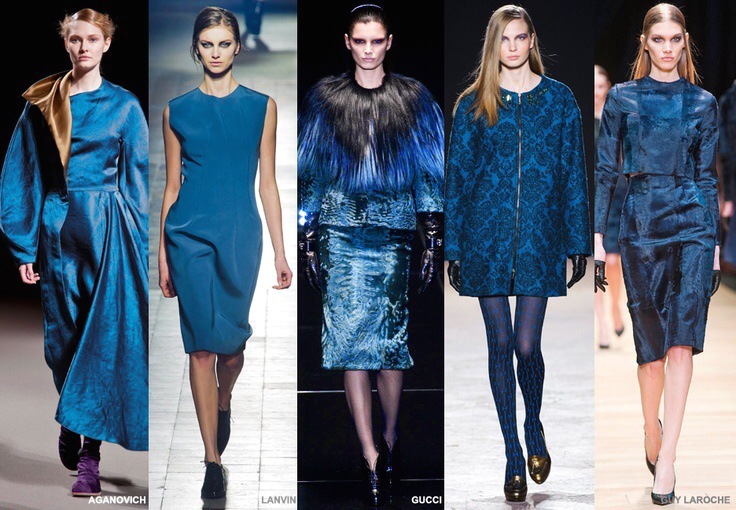 Christian Grey can have his moment in Feb, but for now it’s all about deeper shades of blue! Next Entry Me me me time!